Jesus saw a large crowd coming toward him, and he asked Philip, “Where will we buy enough bread for all these people?” Jesus already knew what he was going to do, but he asked the question because he wanted Philip to think about it and learn something from it (John 6:5-6, my paraphrase, throughout). John included this story so that we could think about it and learn something from it, too. “Well then,” they said, “give us some of this bread” (v. 34). Their response was like the Samaritan woman at the well: When Jesus said that he had water that would give eternal life, she said, “Give me some” (John 4:15), and eventually Jesus said that he was talking about himself. And in John 6, Jesus also reveals that he is talking about himself: “I am the bread of life. Whoever comes to me will never go hungry, and whoever believes in me will never be thirsty” (v. 35). Jesus is the bread who came down from heaven to give life to the world. Just as bread is nourishment for our physical lives, Jesus is the source of spiritual life and energy. The miracle of feeding the large crowd pointed toward a spiritual truth, and that is why Jesus did it, and that is why he wanted Philip to think about it, and that is why John tells us the story. Jesus did many miracles that John did not include in his book, but John includes certain ones to help us have faith in Jesus (20:30-31) — not just believe that Jesus did certain things in the past, but that we would trust him with our eternal future. The miracles are signs pointing us toward Jesus’ spiritual significance. Let’s look at the story again. Andrew did not speculate about the price, but he must have been good with kids. He had already befriended a boy and learned that he was carrying a little extra food. “This boy has five small loaves and two dried fish, but that’s not near enough, is it?” Perhaps he was hoping that the crowd included a few more boys who had the foresight to bring lunch. “That’s good enough,” Jesus said. “Have everybody sit down.” So everybody did. Jesus thanked God for the food, and gave everyone as much food as they wanted (v. 11). It was quite a crowd — larger than many towns are today — and the people began to talk among themselves, “Surely this is the Prophet” (v. 14). They thought that Jesus was the leader Moses had predicted (Deut. 18:15-19)—and yet, ironically, they were not willing to listen to him. They wanted to make him a king by force — forcing him into their idea of what a Messiah should be — rather than letting Jesus do what God sent him to do. When everyone had enough to eat, Jesus told the disciples: “Gather the pieces that are left over. Let nothing be wasted” (John 6:12). Doesn’t this strike you as a little odd? Why would Jesus want to gather all the leftovers? Why not let the people keep the extra? Or let it be a bonanza for the birds and chipmunks? The disciples picked up 12 baskets full of leftovers, John tells us — but then he says nothing about what they did with all those half-eaten loaves. I think there’s something going on behind the scenes. What is there in the spiritual realm that Jesus does not want to go to waste? I think that John gives us a clue later in the chapter. As far as I know, Jesus was not in a hurry. He could have walked back to town on the roads that went around the lake. Or he could have waited for a boat, like the other people did (v. 23). But he walked on the water, apparently to make a spiritual point. In Matthew, the spiritual point is faith, but John says nothing about Peter walking on water or sinking and being saved by Jesus. What John tells us is that when the disciples took Jesus into the boat, “immediately the boat reached the shore where they were heading” (v. 21). This is the feature of the story that John wants us to take note of. If Jesus could do teleporting, why did he need to walk on water? Why not just zap to wherever you want to go? What’s the point? You might have a better idea, but here’s mine: The story tells us that Jesus is not limited by physical circumstances, and as soon as we accept Jesus, we are spiritually at our destination. It may not look like it, but Jesus is not limited by physical appearances. Spiritually, the reality is set; it has been done. The people searched Jesus out again, looking for another free lunch, and Jesus encouraged them to look for spiritual food instead: “Do not look for food that spoils, but for food that endures to eternal life” (vs. 24-27). “The Son of Man will give you this food,” Jesus said, but instead of asking for this gift, they asked what they should do (v. 28). They were asking for works instead of grace. “What does God want us to do?” they asked, wanting to meet the requirements of the messianic age. Jesus told them: “God wants you to believe in the person he sent” (v. 29). The messianic age has already begun, so don’t try to work your way into the kingdom — just trust Jesus, and you’ll be in. Just take that one step, and you’ll be there! Could it really be that easy?, the people wondered. They asked for evidence — as if feeding 5,000 people had not been enough! 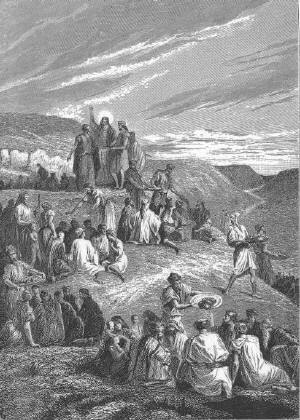 “What miraculous sign will you do that we might believe you?” As an example of a miracle they might be willing to believe, and in keeping with the Passover season, they mentioned a miracle of bread associated with the Exodus — Moses gave them manna (bread from heaven) to eat. Some Jews thought that God would provide manna in the messianic age, too. But Jesus said that the real bread from heaven doesn’t just feed the Israelites — it gives life to the world! (v. 33). “Give it to us,” they said, probably wanting to examine it to see if it met their qualifications. Jesus replied that he was the bread from heaven, the source of eternal life for the world. Once the Father does that, what does Jesus do? He tells us his role when he says, “I will never drive them away” (v. 37). Perhaps they can leave on their own, but Jesus will never push them away. Jesus wants to do the will of the Father, and the Father’s will is that Jesus will lose none of the people the Father has given him (v. 39). He does not let anyone go to waste. Since Jesus does not lose anyone, he promises to raise them up at the last day (v. 39). This is repeated in verses 40, 44 and 54. Jesus stresses that the person who believes in him has eternal life (vs. 40, 47). Jesus also says that people who eat his flesh and drink his blood have eternal life (vs. 51, 53-56). Just as he was not referring to the stuff made from wheat when he called himself the true bread, he was not referring to muscle tissue when he spoke of eating his flesh. Some of the Jews wondered, “How can this man give us his flesh to eat?” (v. 52), but in the Gospel of John, it is often a mistake to take Jesus’ words in a literal sense. For example, Nicodemus asked, How can people enter their mothers’ wombs and be born again? (3:4). Similarly, the Samaritan woman said, Give me some of this living water so I won’t have to come back to this well (4:15). They pushed the literal meaning, but the story shows that Jesus meant something spiritual. Here in chapter 6, Jesus said, “The flesh counts for nothing; the words I have spoken to you are spirit and they are life” (v. 63). Jesus is not making a point about his muscle tissue — he is talking about his teachings. And his disciples seem to get the point. 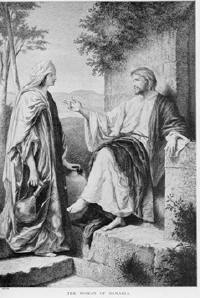 When Jesus asks them if they want to go away, Peter answers: “Lord, to whom shall we go? You have the words of eternal life” (v. 68). Peter was not worried about having access to the flesh of Jesus — he focused on the words of Jesus. The consistent message of the New Testament is that salvation is experienced through faith, not special food and drink. Jesus repeats one more point several times in this chapter: that he is from heaven (vs. 33, 38, 41, 42, 46, 50, 51, 58, 62). The reason that people should believe in Jesus is because he has come down from heaven. He is absolutely trustworthy, because he does not just have a message from heaven, but he himself is from heaven. The Jewish leaders did not like this teaching (v. 41), and some of Jesus’ disciples could not accept it, either (v. 66) — even after Jesus made it clear that he was not talking about his literal flesh, but rather his words themselves were the source of eternal life. They were troubled that Jesus claimed to be from heaven — and therefore more than human. But Peter knew that he had nowhere else to go, for only Jesus had the words of eternal life (v. 68). Why did he know that only Jesus had these words? Because only Jesus is “the Holy One of God” (v. 69). That is the reason his words are trustworthy; that is the reason his words are spirit and life. We believe in Jesus not just because of what he says, but because of who he is. We do not accept him because of his words — we accept his words because of who he is. Since Jesus is the Holy One of God, we can trust him to do what he says he will do: He will not lose anyone, but will raise us all at the last day (v. 39). Even the crumbs will be gathered, so that nothing goes to waste. That’s the Father’s will, and that’s something worth thinking about.